Quarterback Joe Flacco accepted blame for a struggling offense that has held back the Ravens for the first half of the season, Jamison Hensley of ESPN.com reports. The Ravens (3-4) rank 25th in the NFL in scoring with 19 points per game, and Flacco is the 29th-rated passer in the NFL (75.4). In Baltimore’s current four-game losing streak, Flacco has had the ball in his hands in the final two minutes and has failed to deliver the winning drive each time. 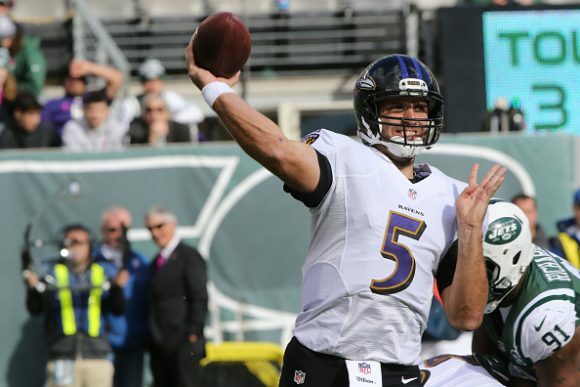 Coach John Harbaugh vehemently defended Flacco’s play. Harbaugh reasserted that he’s “a Joe Flacco fan” and believes in him. It’s big of Flacco to take the fall for some unexpected losses.